Bronze Jewelry is ruling the jewelry market with innumerable styles and patterns of designer jewelries. Gold and silver is getting costlier by each passing day; it’s not possible for a person to buy a new designer jewelry for every occasion. So, bronze jewelry came into rescue, opening up plenty of opportunities for consumers as well as the jewelry designers. There are lots of designs in bronze jewelry that incorporates, precious and semi precious stones and pearls to give a rich feeling to each set of jewelry. Bronze Wire for Jewelry is used in case you want to bind stones and pearls to offer a unique looking jewel, may be a necklace, bracelet, set of ear rings or a dashing finger ring. We at Bronze Jewelry use bronze wires to make different patterns and styles that make awesome jewelry. Thin bronze wire is very suitable for making jewelry. The wire is cut into specific sizes and then beads are woven through it to make various patterns of jewelry. Precious and semi precious gem stones can be used in the same way to make trinkets and jewelry. Usually bronze wire for jewelry is available in 14K gold color with .4mm thickness, but you can get it in rusted gold also. Depending on the jewelry you want to make, the thickness of the wires vary. In our store you can get ear rings, necklaces, bracelets, pendants and finger rings made from bronze wires and stones or pearls. 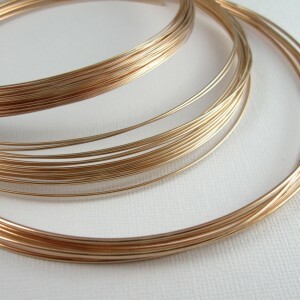 Bronze jewelry wires of thickness 0.4mm, 0.5mm are ideal for jewelry making. These wires are cut with the help of mini pliers and wire cutters, to achieve the perfect size for making different types of jewelry. Jewelry making is an art and not every people have the keen eye to create master pieces. Our expert jewelry designers are trained and know the best way to make bronze jewelry, either with bronze wires or the traditional methods of jewelry making. But beads and wires are the hot favorites of this season. Women of all ages want jewelry that would be traditional as well as funky to make them look younger and lively. Long hanging ear rings are made with jewelry wires and adding beads and stones between them give a rich and colorful appearance to your personality. Thick wire is usually used to make the hooks and locks of necklaces and bracelets, whereas the thin wire is used for the designing part of the jewelry. Bronze jewelry for men and women both include bronze wires to design them, but specifically women’s jewelry is made from bronze wires. Choker sets can be made out of the thick bronze jewelry wires that are suitable for women of all ages. The wires are very hard, to bend and give strength to the jewelry and retain the original pattern with time. Bronze jewelry designs are in a very large range as they are easily mould into different patterns to make jewelry and with the help of colorful beads, stones and pearls it’s pretty simple to make designs that catch the fancy of every heart. If you are a woman, then you are sure to fall in love with our collection of jewelry designs and if you are not, then pick it for the woman you fell in love with and see her smile joyfully. Precious and semiprecious stones like tanzanite, amethyst, quartz, blood stone, onyx, citrine, topaz, moonstone and aquamarine are used for jewelry making. They give a colorful aura to the jewelry and the wearer as well. Diamond being a very expensive crystal is carefully used with gold and silver only. The bronze wires let the enclosed beads and stones play hide and seek with light and add a distinct touch to the wearer’s appearance. Bronze jewelry bracelets can be created by using the bronze wires and adding crystals, as well as pearls and tiny trinkets that would look very pretty and elegant for a bracelet. The wires are wrapped around the crystals or inserted through the hole made through the crystals, both ways it will make an awesome set of bracelet. While buying bronze jewelry, make sure that the wires are neither broken or have tapering ends that are not properly secured, as it can come contact with skin and hurt you. Be stylish and stay safe, enjoy life to the fullest.